We're going to wish we were. But it's not as simple and straightforward as an alien invasion. Now, Fleet Intelligence officers Jason McKay and Shannon Stark are forced to weigh the lives of the people they lead-and the ones they love-against their duty, honor, and planet. A thrilling space marine tale, an interstellar, political plot with twists that keep you guessing still. Uncover the unfathomed mysteries of the universe today when you click Buy now. 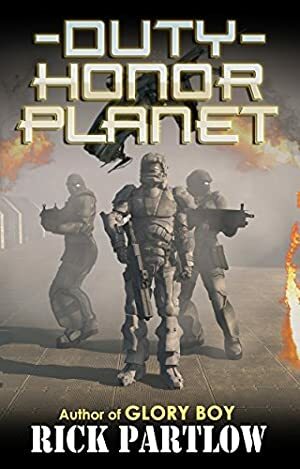 Look for the next two novels in the series, Duty, Honor, Planet: Honor Bound and Duty, Honor, Planet: The Line of Duty now available on Amazon for Kindle. Log In to track Rick Partlow on eReaderIQ. to be notified each time the price drops on any book by Rick Partlow. to stop tracking Rick Partlow. We started tracking this book on September 20, 2011. The price of this book has changed 24 times in the past 2,774 days. The current price of this book is $0.99 last checked 17 hours ago. The lowest price to date was FREE last reached on February 26, 2017. The highest price to date was $3.99 last reached on October 26, 2017. We last verified the price of this book about 17 hours ago. At that time, the price was $0.99. This price is subject to change. The price displayed on the Amazon.com website at the time of purchase is the price you will pay for this book. Please confirm the price before making any purchases.